I was asked to take a writing test the other day. I pulled out my laptop, but I was stopped. “No technology,” I was told. A few minutes later, the pain in my hand reminded me why I love keyboards, even though I am a two-finger typist. Writing has been replaced by typing for most of us. My hand cramps if I try to write for more than a minute with a pen, because the handwriting muscles have atrophied! Remember the 3Rs? Reading, writing and ‘rithmatic? As grammatically incorrect as they were, they were nevertheless the sacred foundation of education programs everywhere. Well, no more. Finland is making luddites of the rest of us by removing cursive writing from its curriculum, and replacing it with typing. It seems that handwriting is an anachronism in a time when people text and email, type and punch buttons. Is it a good thing that we stop writing by hand? First, it is the last vestige of our own humanity. A hand-written note will always be written by a human being. A typed note can be created by code and an algorithm. In fact, most major websites today create messages on the fly, and there is no reason to believe that this will not become more and more common with the Internet of things. Second, something hand-written is personal, as you can read in this post on dating advice and writing love letters. And there are times, like when courting your heart throb, that personal is best. There are times when personal is best, and that means writing by hand. Third, paper notes, whether handwritten or printed, preserve the future. There is no reason to believe that archeologists from 200 years in the future will be able to read the data on a smart phone or a tablet. We have all seen Star Trek, and they have no USB ports. But as long as humans of the future have functioning eyeballs, they can read anything we write on paper, canvas or cave walls. Speaking of Star Trek, we’ve all seen that nobody will type or text or push buttons in the future. We will all be speaking into our computers. So fourth, why even pretend there’s a reason to learn 2015 button-pushing and key-pushing technology (or spelling, for that matter) when in a matter of mere centuries it, too, will become a quaint anachronism? Should the students in Finland (and elsewhere) stop learning cursive writing? Sure, if we plan to ban ballet, classical music, Shakespeare and romance. 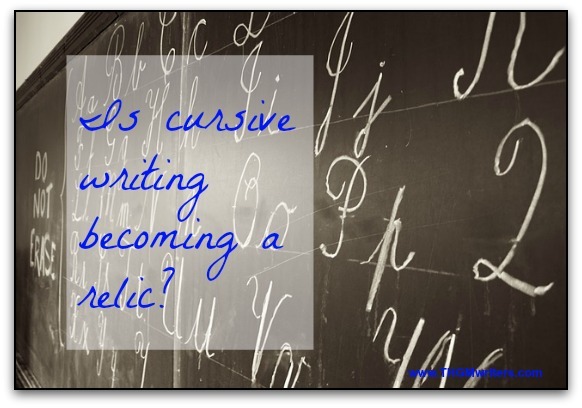 Is cursive writing a lost art? Perhaps more to the point, is it just that – art – and nothing more? Someday cursive writing might be pointless, but has that day come yet? We still need writing and we still need paper. But perhaps paper writing skills will be relegated to an select group of professional calligraphers. After all, we need nuclear science and nanotechnology, but they never taught me that in school. What are your thoughts on this? Is the time right to move on and turn cursive writing from a basic function into an art form? I believe we need to preserve this. I know I am not that great in this discipline, but when I do write it is very personalized, even if I look like a Dr. when I write cursive. Sorry Dr’s just kidding. When I worked on Parliament Hill, my boss was a pharmacist by training. I learned to read chicken-scratch. You still type with 2 fingers? I learnt typing on a type writer, so all my fingers are pretty much functional. I don’t think the time to kill cursive writing has come. Hand writing is still important and I can’t imagine a school where students type rather than write. Though on the other hand, paper does eat up a lot of wood and a digital medium, non-print, might be a greener approach. Personally I write bad. My handwriting is poor – have worked hard on it but still it is really bad. I hated writing mainly because of my handwriting. Very recently, I found out that my doctor’s handwriting is even worse and I even got a medicine wrong due to it … I guess sometimes print isn’t that bad? Well, it hasn’t been “banned” in the United States, but, there are states that have removed it from their curriculum. They deem it obsolete and more of an art form that they don’t have time to teach. I live in Georgia, and there are many educational skills that the decision makers deem unnecessary . . . including the subject of Spelling. My children are homeschooled and they are learning cursive. After all, future adults should be able to read original source documents like the Constitution instead of needing it translated for them. I shared your article on with my daughter. Within the past week we were talking about the idiocy of not teaching cursive writing in the public schools any more (at least in Georgia, where she lives). I agree with you, typing and speaking into computers, tablets, phones and whatever other digital devices will not hold the same level of importance for archeology and anthropology for future generations. Timely and important subject, David. I love my technology but banning cursive? That’s just taking things a bit too far. Being glued to computer screens as much as kids are these days is awful. Nothing says sweet and thoughtful like a handwritten note – typed ones are so impersonal. Agree with all your reasons! Thanks for sharing, David. As a writer, I use penmanship every day. I keep a bullet journal for my daily activities, use a paper planner to track my blog posts and have a personal journal (where I write in cursive). There was a time when my handwriting skills were disappearing due to lack of use, but once I incorporated handwriting back into my habits, it returned and I am more than able to write for long periods of time via a pen. Writing with a pen on paper seems to tap into a different and more creative part of the brain than using a keyboard. What you write on paper never moves around as the text on a screen does. It makes the information more memorable to the human brain. I do most of my brainstorming on paper for this reason. Writing on paper means that I don’t need batteries to read or write the information and it is always “on”. Whatever I write will remain for years with no incompatibility issues. I have been noticing a return to teaching children to write with pens and my fellow writers all seem to be incorporating paper into their work flows where once going “paperless” was the goal. I don’t believe that abandoning a process that has worked well for centuries in a single generation is the right move. I agree, Wendy. In fact, I organize some things on my computer, with my up-to-the-minute to-do list on paper in front of me , and big picture strategic lists on a white board on the wall. Different locations, different purposes, different media. I am all FOR preserving handwriting! I love writing. I have been writing since I was 4. In cursive. Tell me how you did on your test, David. My younger daughter would love you, Lorraine. You said the magic word. Purple. Hi David! Nice to find you here via Triberr 🙂 I actually have a blog called “I School at Home” I don’t do much with it at the moment, but awhile back, I tackled the cursive writing thing from the point of view of a homeschooling mother. With my four boys, I decided not to teach how to write it. We learned how to read it, but I decided to focus more on fine motor skills like drawing and painting (and other similar things) instead. There is only so much time in the day, and if you’re not really into calligraphy 🙂 I honestly can’t see the point. Culturally, I understand wanting to preserve it. But on the micro-level, it just didn’t make sense with my sons. I confess that my own “cursive” is a bit of a hybrid between cursive and printing. But at least it is fairly legible. I certainly agree about the fine motor skills. If children don’t learn cursive, they really need some other discipline to develop those. it is cool to see how so many commenters have good things to say about cursive writing. cursive is much more artistic and personal than print.that personal style is epitomized in the signature. cursive does not take a long time to learn any more: you can learn it in 4 easy lessons at cursivelogic.com. Well, for one thing, where I am now I have no WIFI outdoor, so it’s way easier for me to grab my favorite notebook and a pen and write notes as I’m thinking of something. Writing on the screen or even using a type writer, well you need to have the screen or the type writer. It will always be easier for me to have a pen and paper. That always work.s everywhere. Devices don’t always work everywhere.